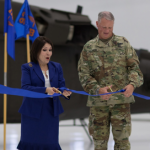 The Army National Guard held a ribbon-cutting ceremony Saturday to mark the opening of its aviation support facility with a readiness center in Kankakee, Illinois. Construction of the Army Aviation Support Facility was financed with $53.7 million in federal funds and $11.9 million in state funds began, the Illinois Army National Guard said Saturday. The military organization intends to relocate approximately 200 traditional Army National Guard Soldiers, 40 full-time employees and 10 UH-60 Blackhawk utility helicopters from Chicago Midway Armory to the 112,150-square-foot AASF. AASF features maintenance hangers, shops, flight facilities, fuel distribution, fire suppression systems and a cold storage. The facility’s 73,050-square-foot readiness center has classrooms, offices, ground equipment maintenance, a weapons simulator and flight simulators, vaults and a medical clinic.